Soooz Says Stuff: Interview with Brendan Gisby author of "The Island of Whispers" and more. Interview with Brendan Gisby author of "The Island of Whispers" and more. Join me in welcoming Brendan Gisby author of~ ‘The Island of Whispers’~ ‘The Olive Branch’~ ‘ Ferry Tales’ and ‘Bookies Runner’. You were born and raised in and around Edinburgh…. have you ever lived anywhere apart from Scotland? I've visited many places round the world and I've dallied for a while in Venice in Italy, but my permanent home has always been somewhere in Scotland. And that, I'm almost certain, is how it's going to remain. I don't know if you've ever been here, Soooz, but Scotland is a wonderful country with much history and much beauty to enjoy - just so long as you can handle its climate! Have you ever had the desire to relocate, and if so why? 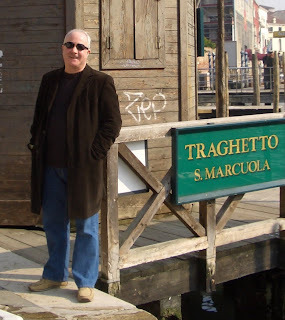 Having been frequent visitors to Venice over the years, my wife, Alison, and I had pretty firm plans to move to the city and live out the rest of our years there. We were, and still are, enthralled by the utter, haunting beauty of La Serenissima, and we loved the idea of decaying gracefully with it. So recently we spent the best part of seven months there - to test out our dream, as it were. Clearly, things didn't work out. We found that the place was being eaten alive by the cheap flight brigade of tourists, that the local people had grown rude and surly as a result, and that many of the locals had resurrected a centuries-old tradition of fleecing visitors. It wasn't the Venice we knew and loved. Our feelings now can be summed up in this quote from one of my short stories about Venice: "The turisti could have Venice. For all he cared, the place could decay and fade away, disappearing under the laguna and taking its offensive people with it." Set on a rocky islet lying in the shadow of the world-famous Forth Rail Bridge in Scotland, this superbly written tale centres on the creatures who inhabit it – a huge colony of rats who have made their home beneath the crumbling ruins of the monastery and who have gone undetected by humans for hundreds of years. But "home" is hardly the word for the native black creatures living under the cruel dictatorship of the larger brown rats who took over the colony when they first arrived in their masses from a passing foreign ship. Of the original black rats, Twisted Foot is a rodent on a mission, and one cannot help but feel compassion for our protagonist as he carries us along with him through his trials and tribulations, until finally deciding to take matters into his own hands and make a bid for freedom. He and his motley band of co-escapees just happen to go in the middle of a major storm on the eve of the bridge's centenary celebrations. Can they survive the wind and rain and frothing sea, the fireworks extravaganza exploding around them, and the many thousands of humans who have flocked to the bridge? Do they manage to traverse the treacherous bridge and make it unscathed to the safety of the mainland? Will they be able to a begin a new society free from slavery and tyranny? Find out in this is delightful and cleverly constructed story. With his excellent powers of description, Brendan Gisby has produced an enthralling and utterly fascinating book – and one which is an absolute must for anyone who has ever read and enjoyed “Watership Down”. 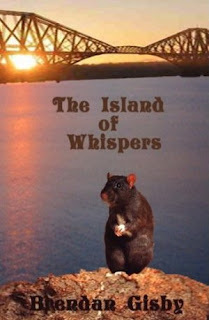 My research indicates that your book “The Island of Whispers” has been likened to Watership Down…do you agree with that comparison: and if so--why? Was that an intentional marketing tool? Using the "Watership Down" comparison as a marketing tactic was probably the farthest thing from my mind when I began to write the book all those years ago. Marketing is king these days, though, so it's always the first thing on my mind now. "Watership Down" with a difference - that's my mantra! How and when did the idea of writing a book about an underworld of rats come to you, can you recall? I began to develop the idea shortly after attending the centenary celebrations of the Forth Bridge back in 1990. The incidence of rat populations on small, uninhabitated islands is commonplace in Scotland. What if there was such a population on the little island that's tucked under the bridge? What if a group of them decided to make a bid to escape from the island? And what if they did that slap-bang in the middle of those celebrations, with fireworks bursting all around them? The story grew from there. Definitely the latter, Soooz. When I began to write it, I had only one objective - to entertain! Not that I remotely class myself among them, but I'm sure many renowned authors embarked on their classic adventure stories with that same simple objective in mind. You have a dark underworld, and the protectors…deformed heroes and ritual sacrifice…this is not a childrens book. Nor was it ever intended as one. However, I have agreed with my local library that it can be read safely by children over the age of 11. What market is “Island of Whispers” aimed at? With that proviso on younger children, the book is aimed at people of all ages, just like "Watership Down" is. Without trying to sound too bumptious, I would like to think that it might be enjoyed most by people who prefer literary fiction. My biggest challenge, however, is to persuade readers to overcome their natural abhorrence of rats and stick with the story - it really is worth it! Yes, there are some nasty rodents to contend with, but there are also some endearing ones. Just take a look at Twisted Foot on the book cover. Isn't he lovely? Did you draw comparisons with people you have known to create the characters of “Twisted Foot and The fat one; Long Ears and Long Snout”? The few human characters in the book are based on real people from my home town, but the extensive cast of rat characters are all imagined. The latter are the kind of characters - stereotypes, if you like - whom I wanted to populate the story: the modest, reluctant hero (Twisted Foot); his spooky, introspective comrade (Long Ears); the grumbling, overweight one (appropriately called Fat One); the nervous, gabbling one (Narrow Back); the sadistic killers (Neck-Snapper and Jagged Fangs); the vicious tyrant (Long Snout); and so on. The plot is fascinating and quite involved, did you have a storyboard that you worked from to keep track of the plot steps? Kind of, I suppose, he says in a small, embarrassed voice... I plotted out the first four parts, so I knew roughly what would occur in each. I also had a list of characters and a little map of the island and its underworld to guide me. However, it wasn't until I sat down to plan the fifth and final part that I knew how the story would end and how all the pieces would fit together. Probably not the best way to do things! You began this book in 1990…why the twenty year wait? And, yes, there was also a twenty-year gap between finishing the first three parts and writing the last two parts. Back in 1989, I left my job to set up my own consultancy. I also bought myself a word-processor (remember those?) for the new business. Work was pretty slow to begin with, so I spent much of my time tapping out some short stories and the first parts of "The Island of Whispers". Then the business grew and grew, and the partially completed manuscript was consigned to a bottom drawer. What finally drew you back to it? A stroke - only a slight one, thank God - early on in 2008 forced me to realise that business wasn't everything in life. So I retired immediately and began to do what I had always wanted to do, but could never find the time for - write for pleasure. An author’s personal history is often reflected in what they write… have you drawn upon significant events in your own life in this work? Out of all the stories you have written do you have a personal favourite? And if so why? Yes. It's called "The Hero" and it's the first story I wrote after my stroke. 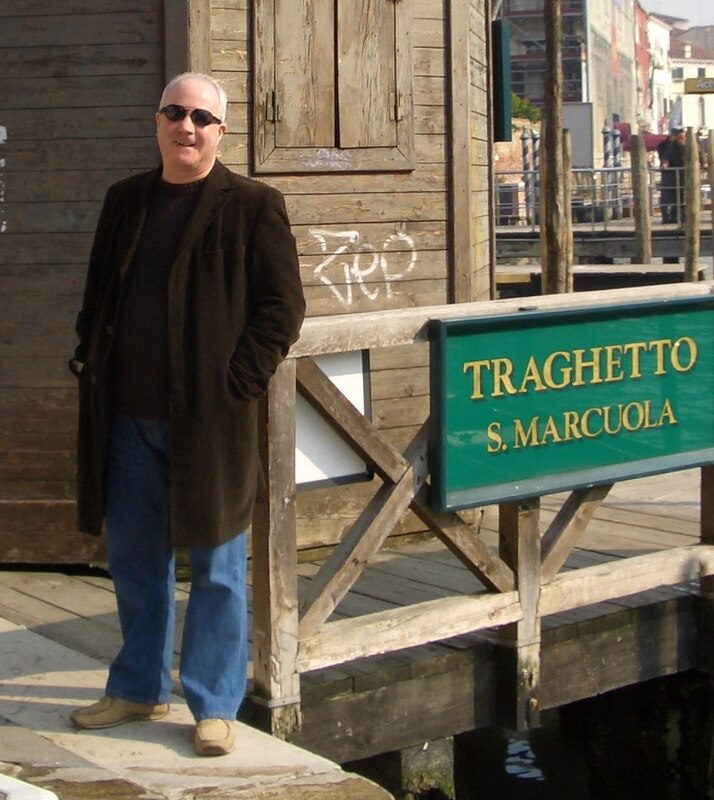 I began to compose it on a crisp, stunningly beautiful winter's day in Venice as I gazed out over the Grand Canal. It's based on the real experiences of Cherry, my step-grandfather, who was not only a War veteran, a Desert Rat, but also a local hero - a true working-class hero. Tell my readers a little about your other books? As well as "The Island of Whispers", I have two other published books. One is a thriller called "The Olive Branch". It's actually my first novel, since I wrote it well over thirty years ago at the height of the Cold War when I was in my twenties. Shortly after my stroke, I dusted off the manuscript, set out to retype it on my laptop and ended up writing another novel about that process! Confusing, isn't it? The new novel, which I've called "The Preservation of The Olive Branch", reveals how the attitudes of both the author and the world around him have changed so dramatically in the intervening period. However, when I submitted it to my publishers, they virtually demanded to publish the old novel instead. It had taken me more than three decades to get someone to look at the original manuscript, so how could I refuse? I haven't forgotten about "The Preservation of...", though. It's been uploaded on authonomy if anyone is interested in having a peek. The other published book is called "Ferry Tales". It's my collection of short stories about growing up in my home town in the 1950's and early 1960's. "The Hero" is the first story in that collection. Do you agree with many who say that the traditional role of the publisher has changed? I'm afraid I'm not an expert on any of this, Soooz. All I do know is that none of the many traditional publishers I approached had an iota of interest in "The Island of Whispers". I eventually hit gold with a small, independent and innovative publisher called Black Leaf Publishing. I decided to go with them on "The Island of Whispers" because (unlike many other small publishers) they weren't after any outlay from me and because they genuinely liked and believed in my book. They're also a very friendly bunch, and I was delighted to agree to their subsequent offers to publish both "The Olive Branch" and "Ferry Tales", again at no cost to me. What marketing avenues are you utilizing? Because I'm with a small publisher, much of the promotion work is down to me - and I'm still quite a novice on that score, I'm afraid! At the moment, I'm plugging away at the online interview and review circuit: hence me bagging this interview. I've achieved a couple of smallish coups, though. The "Island of Whispers" received a great review in my local paper. Copies of it are also stocked in a handful of my local libraries, where they are loaned out regularly. I can keep track of them through the library website, and I still get a kick every time I see a new loan! Do you have another work in progress ? Yes, indeed! My latest work is called "The Bookie's Runner". Inspired by some of the stories in "Ferry Tales", it's a biography of my late father. I uploaded the manuscript of it on authonomy back in January. It has received much (genuine) acclaim there, including immense support from you, Soooz. It just seems to touch people in so many different ways. Because it's a True Life story, a review of it has been promised by HarperCollins, the owners of authonomy. Much more excitingly, Night Publishing, another vibrant, new publisher, have agreed (after more blagging from me) to publish an expanded version of the manuscript towards the end of 2010. It will be the tribute of all tributes to my old Dad! And after "The Bookies Runner" is released…what then Brendan? Well--- I'm just loving every minute of this new career of mine. It's what I should have been doing twenty or thirty years ago. So no surprises to learn that there's lots more to come. I'm adding regularly to my panoply of short stories. In time, I'll probably seek to publish another collection, perhaps called "More Ferry Tales". A few people have suggested that I write a companion piece to "The Bookie's Runner" about my late mother. She had a pretty harrowing life of her own. Her father was a Lieutenant-Colonel in the Irish Republican Army in the 1920's, so if I do write about her I might call the book "The Rebel's Daughter". Then there's "The Preservation of The Olive Branch", which I don't want to lose sight of. People who have read it in its entirety have praised it, so I may resurrect it in the not too distant future. And, of course, there's the sequel to "The Island of Whispers". You didn't really think that Long Snout perished at the end of the first book, did you? Man, that tough, old tyrant's gonna last forever! Thanks so much for joining us here, I for one can't wait to read more of this...especially now I know that "Long Snout" survived. Of the original black rats, “Twisted Foot” is a rodent on a mission, and one cannot help but feel compassion for our protagonist as he carries us along with him through his trials and tribulations, until finally deciding to take matters into his own hands and make a bid for freedom. 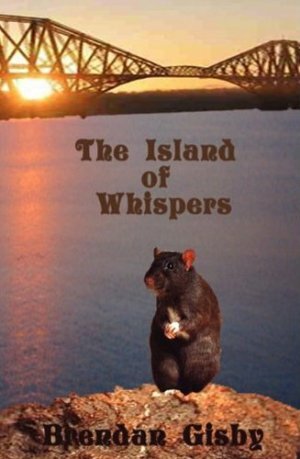 This is the story of a colony of rats living on an island under the Forth Rail Bridge. Ruled over by an ‘inner circle’ of evil fat rats, and in fear for their lives, a group of lowly ‘watchers’ attempts to brave the stormy waters and scale the giant bridge in a bid for freedom. But celebrations for the bridge’s centenary are about to begin.... will they make it? A story of oppression overcome, fierce loyalty, dreams and devastation. Grisly to the end, but with heart. You’ll never look at the little islands in the same way again. On behalf of The Black Leaf Publishing Co. thank you very much Brendan for your kind comments. We are very proud of our Author! Keep writing. On behalf of BLP thank you very much for your kind comments Brendan. You have always impressed us with your writing, and we have the greatest faith in you. Any accolades you receive for any of your books are more than well deserved. Keep on writing - we're so proud of our author. I had to start this book over several times mainly since I can't stand rats. Once I was able to stick with it, I found the Island Of Whispers an engrossing tale from start to finish about breaking away from cruelty and dictatorship. Mr. Gisby vividly showed me the nature of the human condition while holding you in suspense to the very last page! His powers of description kept me both cringing and enthralled. I cheered as Twisted Foot, his friends, their mates and youngsters climbed the bridges foot to escape to freedom. I held my breath as they were spotted and chased by the ruling rats. I recommend The Island of Whispers to anyone who hasn't read it!